pocket with a secure feeling of privacy right in the midst of vibrant S Kilda, the location is truly unbeatable. Amazing bars, restaurants and other attractions are right at your doorstep. FREE WIFI, NETFLIX and SECURE PRIVATE PARKING. I am an interior designer with a love of high quality hospitality and beauty in all things. My goal is to provide my guests with a memorable experience of an amazing getaway in uplifting environment. I want to share with my guests my love of the Melbourne lifestyle, with its vibrant arts, restaurants and sporting culture. Having travelled widely myself in Australia and overseas I know how amazing Melbourne and St Kilda are as holiday destinations and love to point my guests in the right direction to discover the delights that await them here. St kilda is a vibrant and colourful place with a glorious beach and many marine sports. There are diverse restaurants and bars, and cool shops in the renowned Fitzroy and Acland streets right around the corner. Everything is at your door step. The apartment has an amazing views from the living room, dining and kitchen window of the sea and beautiful gardens. Its also close to some of Melbourne's best restaurants. 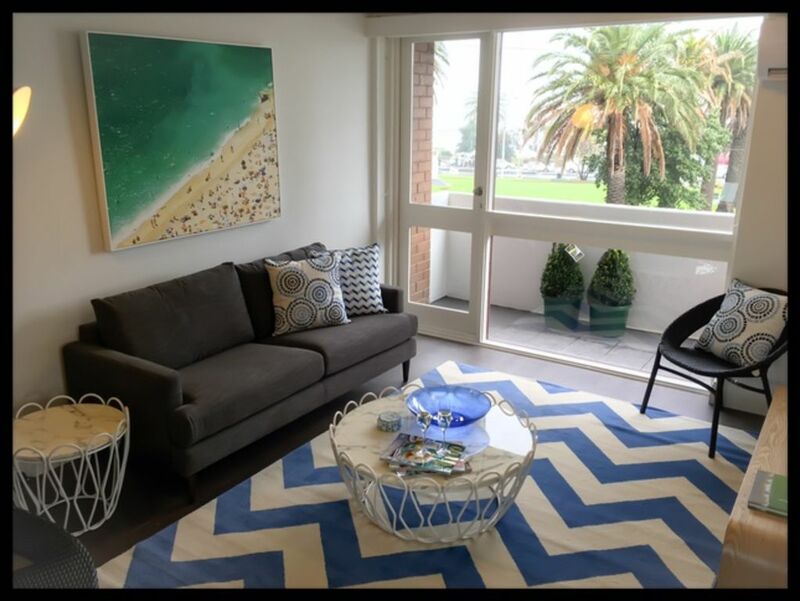 Can definitely recommend this condo for its lovely décor and great views of Port Philip Bay. We appreciated the responsive communication with the owner and the birthday cookies she provided :-). As other reviewers say, it's very close to tram, beach, restaurants, Luna Park, etc. During our stay we also discovered that the SkyBus to/from the airport stops at the Novotel about 100 meters from the condo, so we wound up taking that back to the airport. For the two of us, it was about $20 cheaper than Uber. Would stay here again! This is a great apartment with everything you need and want. Close to CBD, cafes and restaurants, transport and easy parking on site. Unfortunately the windows did howl in the bedrooms and rattle when the wind was blowing affecting our night's sleep - but all in all would stay again! Ornella was fantastic in ensuring we had everything we needed - fantastic hostess. This lovely apartment is beautifully decorated, clean & has everything you need for a comfortable stay. The location is fantastic. Tram at your door, Acland St & Luna Park a short level stroll & of course St Kilda Beach right across the road. This property was fantastic all round. Great view, location, very comfortable with all things you need. Ornella is very welcoming, extremely accomodating and very easy to communicate with. Excellent location in St Kilda and I hope to visit again.